'from a basement on the hill reviews are beginning to show up online and in magazines. here is a list of them so far we have seen"
eye: album review by john sakamoto. anti posted this review on their elliott page here. there is a new music book that transcribes 24 piano songs including elliott's song off figure 8, 'son of sam'. the mix songbook is called '21st century rock piano.' it also looks like the song was also transcribed in 2001 in a songbook called, 'play piano with... coldplay, toploader plus...' based on a search of musicroom.com. a search for elliott smith also brought up 2 other piano songbooks that include 'miss misery'. if you would like to see a listing of all 4 songbooks, please click here. thanks to mike! thank to lesley for sending info about a bbc broadcast of elliott's songs and the chance for you to listen. here what lesley had to say: just to let you know that bbc six music's (uk digital and internet radio station) keith cameron (sitting in for presenter bob harris) has been playing elliott tracks - don't go down this week and fond farewell the week before. you can listen to the show each week on http://www.bbc.co.uk/6music/presenters/bob_harris/ and hit 'listen again' (no archives so check it out soon). the track is about half way through the show. thanks to retrolover for sending this link to an interview with domino records founder, laurence bell. in the beginning of the interview, laurence talks how things came together for domino to release 'from a basement...' and his thoughts on it. please go to poptones to read it. live dvd out in nov., insound pre-order and faboth songs on french radio! 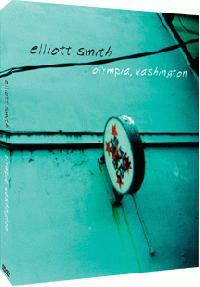 thanks to rustyorgan, jane, alex and kitty fantastico for giving us the information that music video distributors and hiqi media will be releasing the upcoming dvd, 'elliott smith – olympia, washington.' the dvd features elliott's solo set on the closing night of the five-day yo yo a go go festival in 1999. the dvd will be presented in stereo and will be zone free. the performance is 40 minutes long and at this time there are no other dvd features or extras known for this release. the setlist includes these songs: son of sam, angeles, rose parade, happiness, easy way out, southern belle, wouldn’t mama be proud, division day, the white lady loves you more, stupidity tries, see you later, independence day. mtv also has a little blurb about the dvd too. if you would like a copy of the dvd, you can pre-order the dvd now at fattvideos.com! thanks so much melinda (& happy birthday!) for telling us that at this year's bumbershoot, in seattle, wa, they were giving out cds and included on the cd is pretty (ugly before) in cd form. this is the first time it has been officially made available on a cd. it was previously available on the elliott's last 7" record released by suicide squeeze. the song will be also included on elliott's upcoming record. thanks to james for sending us an update about the upcoming elliott smith tribute show on friday, september 24th at university of london union (ulu). if you check out the official webpage for from a basement to the stage - a show for elliott smith, you will be updated with who will be performing and how to get tickets. tickets will be going on sale this friday, sept. 3rd, at ticketweb.co.uk. there are also a couple of updates at sweet addy too. if you click this link you will see the really nice poster they created for the show. thanks to everyone involved!